New Age is as popular as ever. 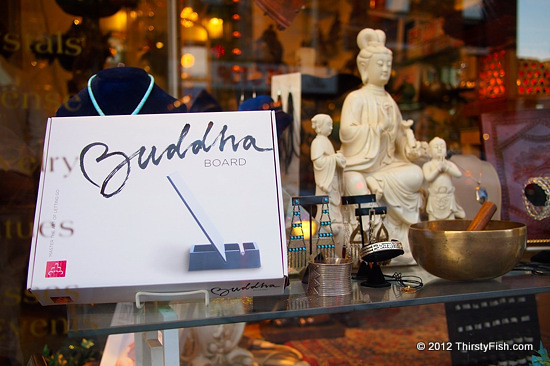 I noticed this product box in the window of the South Street New Age bookstore, Garland of Letters. The label read: "Buddha Board - Master the Art of Letting Go". I couldn't figure how the Buddha Board was supposed to help us to let go until I got home and looked it up; The surface of the board is painted using water and as the water evaporates, so does the painting, hence the "Zen" concept of letting go. TaDaa! I wish the Buddhist concept of impermanence could be taught so easily. The top product review on Amazon reads: "Works great really I love it and its all I ever wanted..." - All I ever wanted! The New Age Movement is a Western movement that draws from Eastern and Western spiritual practices, and fuses them with concepts from various disciplines such as, self-help psychology, holistic health and consciousness research. New Age has also become a niche market, offering literature, books, music, crafts, alternative medicine and other products and services. Personally, especially in our materialistic and consumerist society, I admire that the New Age Movement offers a spiritual alternative, but, for the most part, I find it to be a kitsch. The Buddha Board is merely a product, and it is not going to help anyone to "let go", or function in our understanding of the concept of "impermanence". In a world where happiness salesmen are becoming more skillful and persuasive, we need to be very careful in discerning between New Age concepts that truly help us, and those that only fill the pockets of gurus and spiritual leaders. Buyer beware!